So, apparently, the reader’s of the Kalamazoo Gazette voted Red Robin as the best burger in Kalamazoo. That’s crap. Don’t get me wrong, I like Red Robin and it’s one of my family’s favorite places to go when they visit, but there has to be a better burger somewhere in Kalamazoo. It’s true, no one will have the variety of burgers that Red Robin has, but it’s still a chain product that loses some quality in transportation. I have no idea where to start when it comes for looking for a quality burger. When I judge burgers, I judge the most basic product. The meat and the bun. To me, those are the two most important qualities. I don’t care about sauces. I don’t care about toppings. A hamburger is only as good as the meat. As I was browsing websites, I came across the Corner Bar & Grill. They have a note on their website that their meat is ground fresh and pattied daily. That sounds like a good start to me. The Corner Bar & Grill sits on the (surprise) the corner of Vine and Mills Streets in Kalamazoo’s Edison neighborhood. It’s a neighborhood bar in every since of the word. It’s in a pretty residential neighborhood and at first glance, parking is on the streets. Luckily, that’s not the case as there is a gravel parking lot across the street. We decided to go in for a Saturday lunch. All the reviews I read mentioned the bar wasn’t in a great neighborhood and we didn’t really want to go while they had live music. While we’re big fan of bar foods, we’re not always fans of the bar scene. It’s nice every now and then, but not when we want to enjoy a meal. We weren’t the only ones with lunch on the brain though. There were a few other tables and a few guys sitting at the bar watching college basketball. We took a seat in a booth in the main bar area. I didn’t look around too much, but I could see another room up a couple stairs from where we were sitting. I saw the waitress go up there with food, so there must be more tables up that way. The decor of the bar is classic neighborhood pub. Tacky Christmas lights that probably never get taken down, antique beer signs, sports memorabilia, and LCD TV’s. For someone who grew up in a small town, this place has a really homey feeling. My mom moonlights as a waitress at a bar like this and it’s one of my favorite places to go when I go home. 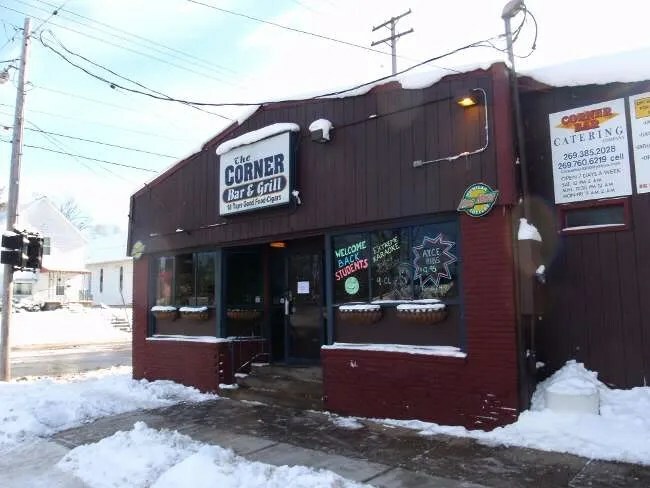 The Corner Tap has 18 beers on tap and actually had a special on my beer of choice, PBR, but we both went with Pepsi’s. While the waitress was getting the pop, we had a few minutes to look over the menu. I actually found a few sandwiches that looked good, but I was there for the burgers. I really want to find that special burger somewhere in this town. I went with the Cajun Bacon Burger. The burger comes with thick sliced and seasoned bacon, cheddar cheese, lettuce, tomato, and mayo on a sourdough bun. Now, on the on-line menu, they list the mayo. On the menu in the restaurant, they don’t. I know they don’t because I read it three times and it didn’t say mayo, so I was a little surprised to find mayo underneath the lettuce on the top of the bun. J actually did a really good job of scraping it off with a knife though and it turned out, I couldn’t even taste it. The burger was delicious. 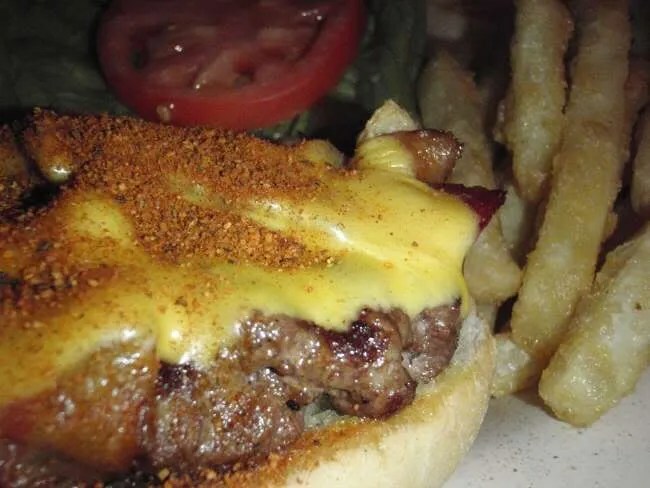 The bacon had some extra Cajun spices on top of it and the cheese was perfectly melted. The fresh meat was fantastic. The unfortunate part of the burger was that the bun sort of cancelled out a lot of the flavor. It was a soft flaky bun, but every bite included more bun than meat. If they change the bread, this burger would be fantastic. The sandwich came with chips, but I upgraded to fries for a $1.50 more. The fries were great. They had a light beer batter and were fried nice and crispy. J went back and forth on a few different choices, but eventually went with her usual selection, the Buffalo Crispy Chicken Wrap. 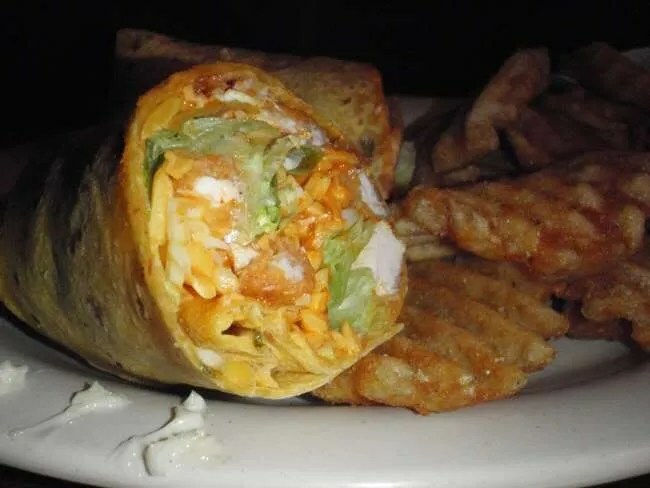 The wrap starts with a flour tortilla that is filled with crispy chicken that is coated in the secret Corner Buffalo Sauce. It’s then finished off with lettuce, tomato, mozzarella and cheddar cheese. She opted to leave the tomato off like she normally does. She really liked the wrap, but the buffalo sauce was pretty hot. She ended up asking for some ranch dressing to cool it down some. She got seasoned waffle fries with her sandwich for that extra $1.50 and really liked those. She ended up opening the wrap up and giving me some of the chicken because she really wanted to eat the fries. She ate most of the first wrap and a little of the second, but she polished off the fries. Our bill was just over $18 before tip. 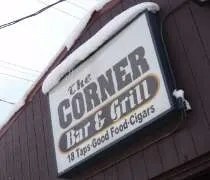 We both enjoyed The Corner Bar & Grill. It really is our kind of place. The burger was really good, but it still came up just a little bit short because of the choice of bread. When it comes to burgers, I like a really juicy, loosely packed piece of meat on a bun that’s going to soak up that juice and offer a little bit of a bite. The sourdough bread didn’t quite do that for me. It’s not enough to keep me from returning. I love these little neighborhood bars that know how to do food right. I was born in Kalamazoo and lived a block away on Jackson St., I walked by that place many times going to Styzitkies grocery to get milk and other stuff at that time, I believe, it had a European (German) name and the aroma of beer, sausage and kraut prevailed. That area was heavily middle European at the time. I remember many Hungarians, Poles, Slovaks and Germans in the neighborhood, it was a very diverse part of town and I remember that we all got along very well. I was just a little Hungarian kid and always went by as fast as I could because it was about 1940 and WW II was going on in Europe. I was just surfing around and came across this site and frankly I am surprised that this local bar and grill is still standing although now no longer in business. I certainly hope it is re-opened as it seems like it was a pretty decent place to get a beer and a sandwich or even spend the night there with a few friends.